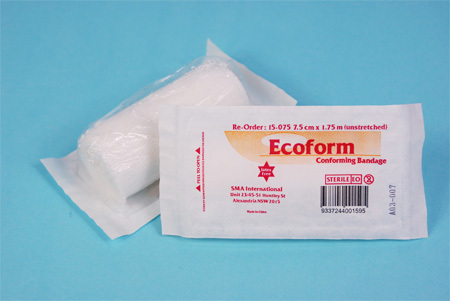 Call 61 2 8853 188..
EcoForm® is a highly conformable, lightweight retention bandage. 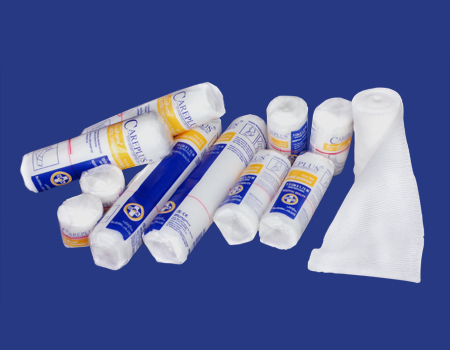 Woven from viscose and polyamide yarns, this bandage is soft and porous, permitting air circulation. EcoForm® offers high stretch and limited regain properties, avoiding the risk of limb constriction. The carefully finished edges also minimise fraying. Available in sterile and non-sterile. Finished edges to help eliminate unraveling and linting. Self-adhering to be easy to use and renders a neat applications. Easy moulding to body contours to allow flexibitlity and comfort without restricting movement. Open weave construction to allow fluids passing through primary dressing to be easily absorbed. Sincere Medical is an internationally award winning manufacturing company specialising on surgical dressings, bandages and some other medical and healthcare consumable products. Its Australian arm trading as SMA International has been operating since 2005 to provide OEM service to some leading brands in Pacific region, meanwhile, in alliance with a few leading distributors and wholesalers to serve Australian & NZ Hospital, Pharmacy, Nursing Home and First Aid markets. The goal of each our product is to meet the highest standard in quality and offer the best competitive pricing, therefore providing customers with the greatest value from our products. Such goal has been achieved in the fact we are a preferred supplier to most well known hospitals and a long term contractor for some state government. Mention MedicalSearch so SMA International can best assist you! Get a callback from an expert at SMA International to help answer your questions.